Good dental hygiene, including regular dental check-ups and teeth cleanings, can increase your pet's health, vitality, and well-being and help ensure your pet leads the best life possible. Proper dental care not only prevents dental and systemic disease, but it also helps minimize the lifetime cost of care for your pet. The veterinarians and medical team at Sachem Animal Hospital and Wellness Center care about your pet's dental health and that is why we offer state-of-the-art dental procedures as a part of our recommended preventive care plan. Dr. Howard Camay has a professional interest in veterinary dentistry and has been performing routine and advanced dental procedures for over 30 years. Sachem Animal Hospital and Wellness Center offers digital dental radiology, which produces high-definition images of your pet's teeth. More accurate than traditional radiology, digital dental radiology produces clear images of the area below and above your pet's gum line in order to diagnose dental disease that cannot be seen by visual examination alone. This is a powerful tool for enabling the treatment of dental disease before it becomes much larger, more difficult, and more expensive to treat. Preventing periodontal disease by keeping your pet's teeth and gums healthy isn't just a job for your veterinarian; it's your job, too. While nothing can take the place of regular visits to Sachem Animal Hospital and Wellness Center for checkups and cleanings, ongoing follow-up oral care at home is just as important in controlling plaque and tartar formation. Brushing your pet's teeth is best started at a young age, before the adult teeth erupt. The younger the animal is, the more likely he or she is to accept it. 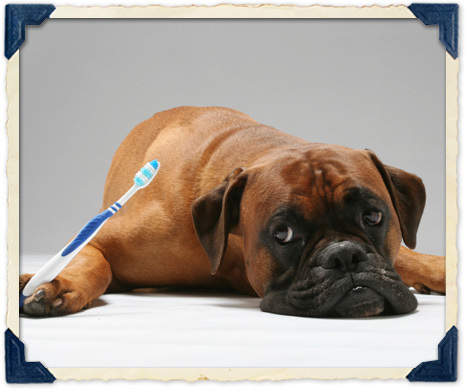 Regular brushing not only keeps your pet's teeth clean and healthy, it also enhances the bond between you and your pet. If you are unsure of how to brush your pet's teeth, please ask a staff member at Sachem Animal Hospital and Wellness Center for instructions. We are happy to instruct and/or demonstrate to you the best and easiest method. Also, please remember to always use tooth paste specifically made for pets, not for people. If your pet has any of the symptoms listed above, please contact us and make a dental appointment for your pet.